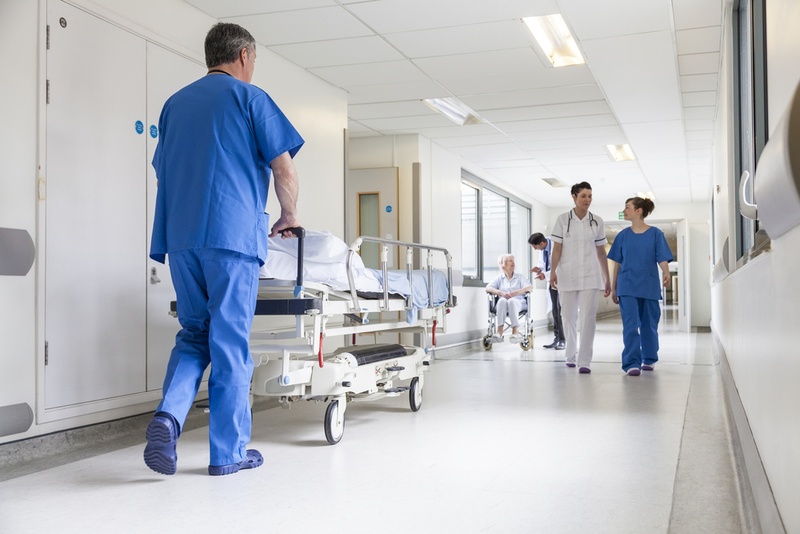 The Affordable Care Act’s excise tax on employer-sponsored plans, commonly referred to as the “Cadillac tax,” imposes a 40 percent excise tax on employer-provided health benefits with a cost in excess of specified thresholds. Although legislation enacted earlier this month delayed the tax until 2022, it had previously been scheduled to affect plans with costs higher than around $11,000 for single coverage and around $29,000 for other coverage starting in 2020. The vast majority of employer-provided plans cost less than these thresholds. The Treasury Department has estimated that just 4 percent of plan enrollees and 1 percent of plan costs would be above those thresholds in 2020 (in a world without the Cadillac tax). These fractions will rise gradually over time because the thresholds rise with the Consumer Price Index in the long run, which is likely to rise more slowly than plans’ spending on health care services, but the tax is likely to apply to a relatively small minority of plans and plan costs for the foreseeable future. The Cadillac tax is an indirect way of curtailing a long-standing tax preference: the fact that, unlike wages and salaries, compensation provided in the form of health insurance is exempt from income and payroll taxes. This treatment implicitly provides an open-ended subsidy for employer spending on health insurance since each dollar an employer spends on health insurance rather than wages avoids those taxes. While there are strong arguments that the tax system should encourage employers to offer health insurance and encourage employees to take up that coverage, this type of open-ended subsidy for more costly coverage likely encourages employers to offer inefficiently costly health benefits at the expense of wages. The Cadillac tax aims to remove that open-ended subsidy, focusing on the highest-cost plans. 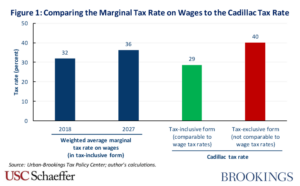 In determining how successful the Cadillac tax is in achieving that goal, a central question is how the Cadillac tax rate compares to the marginal tax rate on wages and salaries faced by typical workers. It might seem natural to answer this question by comparing the 40 percent tax rate that appears in the Cadillac tax statute directly to typical estimates of the average marginal tax rate on wages. As illustrated in Figure 1, the Urban-Brookings Tax Policy Center estimates that the marginal tax rate on wages and salaries, considering both federal income and payroll taxes, will average 32 percent in 2018, rising to 36 percent in 2027 after certain provisions of the recently enacted tax legislation expire. That seemingly straightforward comparison goes awry in a subtle, but important way. The 40 percent Cadillac tax rate listed in the statute is what is commonly referred to as a “tax-exclusive” rate, a rate that applies to a tax base that excludes amounts paid in tax. In the context of the Cadillac tax, that means the tax rate reflects the ratio of the amount paid in tax to the amount the employer spends on health insurance (above the Cadillac tax threshold), excluding the amount paid in tax. By contrast, marginal tax rates on wages and salaries are conventionally quoted as “tax-inclusive” rates, rates that apply to a tax base that includes amounts paid in tax. In the context of tax rates on wages and salaries, this means that the tax rate reflects the ratio of the amount paid in tax to the total amount the employer pays out in wages, including the portion of those wages that will be collected in tax. The tax rate associated with any given tax is higher when reported in tax-exclusive form than when reported in tax-inclusive form. This distinction makes a large difference in the case of the Cadillac tax. The Cadillac tax rate is 40 percent when stated in tax-exclusive form. But when converted to tax-inclusive form, the rate is just 29 percent (= 40/[100+40], where the denominator of this fraction is obtained by adding the spending on taxable health benefits to the tax incurred). Conversely, when stated in tax-inclusive form, the average marginal tax rate on wages is estimated to be 32 percent in 2018, but when stated in tax-exclusive form this same tax rate would be 47 percent (= 32/[100 – 32], where the denominator of this fraction is obtained by subtracting off the amount paid in taxes). Thus, when assessing the extent to which the Cadillac tax removes the open-ended subsidy for health benefits relative to wages and salaries, it is imperative to put the two taxes on equal footing. To see this more concretely, consider an employer deciding whether to devote an additional dollar of compensation to wages or to health benefits, and suppose that the cost of the employer’s health plan exceeds the Cadillac tax threshold and that its workers face a (tax-inclusive) marginal tax rate on wages of 32 percent. For the present purposes, the question of interest is how the fraction of that compensation dollar that is collected in taxes depends on the employer’s decision. The answer to this question is given by the tax-inclusive tax rates. If the employer devotes the dollar to wages, the employer’s workers will receive 68 cents after taxes, with the remaining 32 cents (= 32 percent x $1.00) going to taxes. If, on the other hand, the employer uses the dollar to finance health benefits, the employer must spend an amount on health benefits that ensures enough of the dollar is left over to pay the associated Cadillac tax. The employer’s workers will thus receive approximately 71 cents of health benefits, with the remaining 29 cents (= 40 percent x 71 cents) going to pay the Cadillac tax, in line with the tax-inclusive version of the Cadillac tax rate derived above. It is important to note that most of the discussion in this piece focuses on how the Cadillac tax changes the marginal tax rate on health benefits above the Cadillac tax threshold. This is the relevant tax rate for determining the extent to which the Cadillac tax removes the open-ended subsidy for more generous health benefits and, correspondingly, how likely employer are to change their compensation packages in response to the tax. However, this marginal tax rate is not always the relevant tax rate for determining how much revenue the tax will raise (and from whom). Many analysts, including the Congressional Budget Office, expect many employers subject to the tax to respond by reducing plan costs to the Cadillac tax threshold and increasing wages to compensate. In those cases, it is the tax rate on wages, not the Cadillac tax rate, that will determine the amount of revenue collected. As a final note, correctly accounting for the fact that the Cadillac tax rate is typically stated in tax-exclusive form significantly affects the comparison between the Cadillac tax and a direct cap on the tax exclusion for employer-provided health benefits. 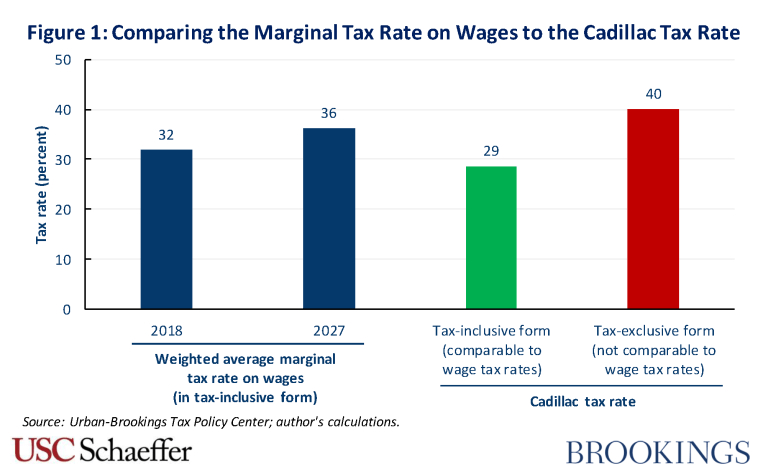 The 29 percent tax-inclusive Cadillac tax rate is lower than the Tax Policy Center’s estimate of average federal marginal tax rate on wages and salaries in both 2018 and 2027, indicating that, on average, the Cadillac tax is modestly less aggressive in curtailing the marginal subsidy for more generous health benefits than a corresponding cap on the tax exclusion. In both years, this is the case across most of the income distribution, with the exception of the bottom 20 percent of households, who are comparatively unlikely to have employer coverage. By contrast, using the 40 percent tax-exclusive Cadillac tax rate in these comparisons would have led to the erroneous conclusion that the Cadillac tax is more aggressive than a cap on the tax exclusion in most cases. This piece focuses solely on the federal tax system. For many purposes, however, it is also relevant to consider state taxes. Accounting for state taxes would modestly increase these average marginal tax rates. These average marginal tax rates are for the full population and are weighted by earnings. For certain purposes, it might be more appropriate to compare to an unweighted average marginal tax rate for the population of people with employer-provided health plans exceeding the Cadillac tax threshold. This tax rate would likely be similar. This distinction between tax inclusive and tax exclusive methods of quoting tax rates arises in many other tax policy contexts as well, notably comparisons of sales tax rates (which are generally quoted in tax-exclusive form) and income tax rates (which are generally quoted in tax-inclusive form). Another way of stating this question is to ask how much tax is paid per dollar the worker receives as after-tax wages or health benefits. In this case, the answer for each type of compensation would reflect the tax-exclusive versions of the two tax rates. Under the ACA as originally enacted, businesses were not permitted to deduct their Cadillac tax payments when filing corporate tax returns. This had the effect of increasing the effective tax rate in instances where a for-profit entity provided or administered a plan’s coverage. However, Congress amended the Cadillac tax in December 2015 to make Cadillac tax payments deductible on corporate tax returns.